The progress of this piece has been documented in previous posts over the least eight months, because I began in January. A long time drawing. The last big piece I made, Et In Arcadia Ego (at left), was so bloody enjoyable & the challenge so thoroughly embraced that I cant wait to start making another one. I DIG making grand landscapes. So satisfying. The title of this piece is a gateway to understanding my intention - why I made it - but its not finished yet so we're not there yet. Actually this is the Great Outdoors part of it so I'll talk again (I'll never tire of it) about landscapes. I love them in general because nowhere else do I feel the presence of God as much as I do through making pictures of grand, dramatic scenes like this. I'm more or less housebound so this is my connection to a greater divine in an interior way. 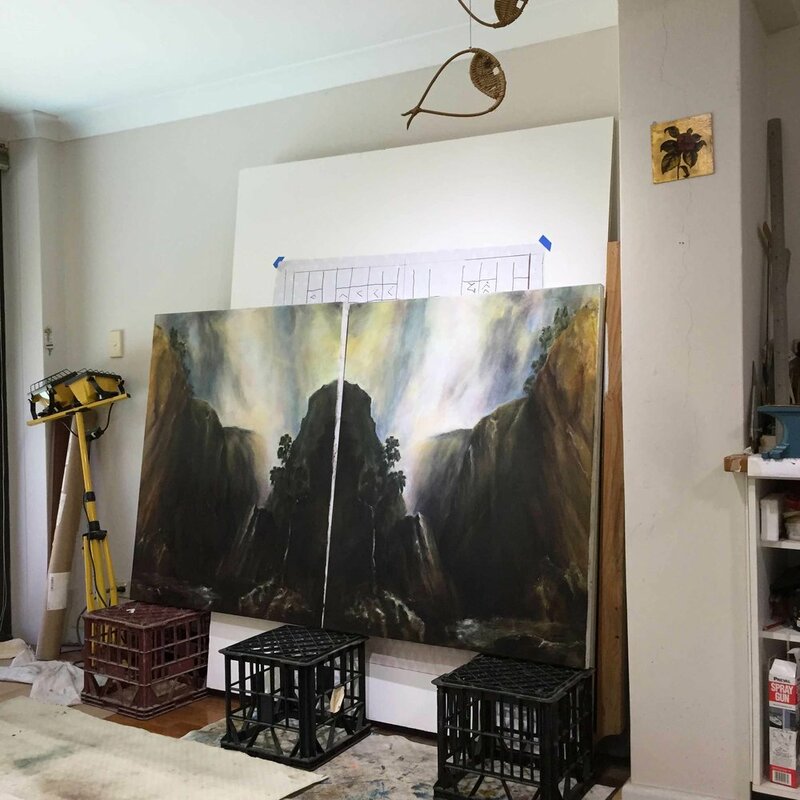 My landscapes are most often taken from 19th century paintings & I feel the power of those artist's skills & want to pay homage to their vision & feel part of the fellowship, the depth of art history & the diptych mirroring device acknowledges that. Pieces like this are something I live in, they are made over several months, so I see landscapes as experiences and in that, they represent the passage of time conceptually and as told through craft and material. I hate trying to describe my work in very personal terms and always feel like a dickhead when I do and yet here we are. I'm not a big deal, I'm doing my thing & when I'm making, I have that feeling that I'm doing exactly what I should be doing, and then I feel God is in my life and everything is ok. I'm not religious but I do have faith and there have been times when my faith has got me through hard things. Having said that, I'd add that being at liberty to do this is a privilege & in this all-too finite world, a world that is increasingly obsessed with surfaces, there is no free pass to 'just make things'; artists articulate life. Conceptually I create possibilities, or versions of answers around resolving the Problem of Life (take that, academia!). Its a never ending quest in pursuit of resolutions around our instinctive need for connection and individuation, the malleable nature of memory and the slipperiness that is that passage of time. Thats also my thing. Its also not really evident here; this is just a landscape drawing and thats also enough.